Optimal nutrition is essential for maintaining the structural and functional integrity of all the organs and systems in the body. This is especially relevant in disease and dysfunctional states when the functioning of organ systems is compromised. This clinical update handbook aims to discuss and debate the impact of nutrition, describe methods for assessment of nutritional status and recommend the diet modifications helpful in managing various types of kidney diseases and dysfunctions. The first chapter of this book describes the various components of a healthy diet when there is no kidney disease or dysfunction. The chapter 2, 3, 4, and 5 provide a brief but relevant review of the dietary modifications and restrictions recommended in diabetic nephropathy, hypertensive nephropathy, renal stone disease, and nephrotic syndrome respectively. The two subsequent chapters 6 and 7 speak of the nutritional modifications indicated in management of acute injury of kidney and chronic kidney disease. The 8 and 9 chapters describe the dietary modifications that are compatible with the two types of dialysis, hemodialysis and peritoneal dialysis. The final chapter of the book describes the dietary recommendations and restrictions applicable before and after kidney transplantation. 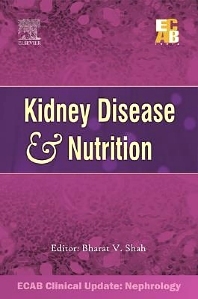 This book will help the readers understand the intricacies of the aspects mentioned above and guide the practitioner to diagnose and manage the nutritional aspect of various kidney diseases with special reference to practical experience in India. The authors have put together the most relevant facts about the disease for an easy comprehension and understanding of primary glomerular diseases by practitioners and students across the specialty. Dr. Bharat V. Shah is the Managing Trustee of Narmada Kidney Foundation and Consultant Nephrologist, at Lilavati Hospital and Research Center and Balabhai Nanavati Hospital in Mumbai. In the past, he has been the Head, Department of Medicine and Head of Nephrology section at P. D. Hinduja National Hospital, Mahim, Mumbai. Dr. Shah has published more than 60 research papers and authored three books. He is a teacher for DNB program in nephrology and member of scientific committee of Indian Society of Nephrology.